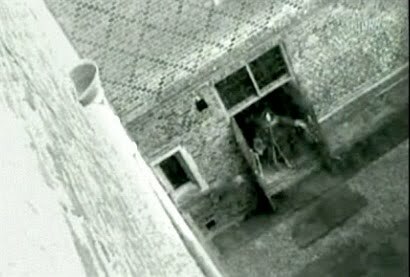 The photo above shows a ghost caught on CCTV (Closed Circuit TV used for security purposes) at Hampton Court Palace in London. 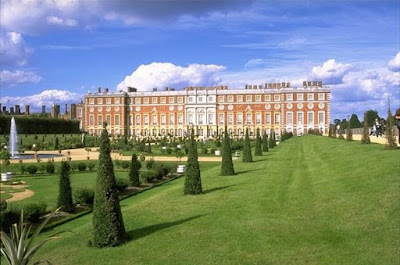 Hampton Court is said to be one of the most haunted places in England with claims that the ghosts of such people as Jane Seymour, Catherine Howard, Henry VIII and other royalty have been sighted. Before the photo (part of a video tape) was captured there had been reports of fire doors at the palace being mysteriously opened. When the CCTV video was perused to try and find out the reason for this security lapse the ghost was seen opening the very same fire doors. Experts who have perused the tape say the ghost appears to be almost skeleton-like, with an extremely white face and also looks to be transparent - but still strong enough to open doors! The Palace is full of history stretching back to the early 1500s and is one of only two surviving Palaces belonging to King Henry VIII. He was given this in 1528 by Cardinal Wolsey and then set about enlarging the building. Today Hampton Court Palace is open to the public but there is no guarantee that ghostly apparitions will be seen. Do you think it (the ghost) looks a bit too real to be true? Wouldn't ghosts go through doors instead of opening them? 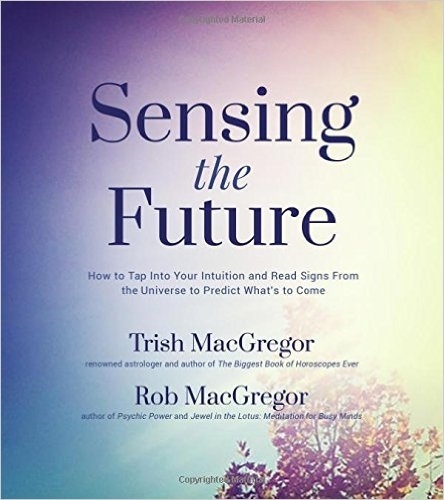 Very interesting and I love Hampton Court Palace, I often visit there, but haven't seen any ghosts. Lots of stories about them though. The video is intriguing. It really does look like some sort of apparition. Just curious - but was this ghosts one of the famous lineup mentioned in your post?? The ghost is dressed in the kind of hat and coat which date from a period later than Henry VIII - perhaps from the late Elizabethan period, or after, say 50-70 years after Henry died. Of course Hampton Court has always been occupied.